With foreign languages now part of the Key Stage 2 national curriculum since September 2014, there has never been a better time for young children to learn French. 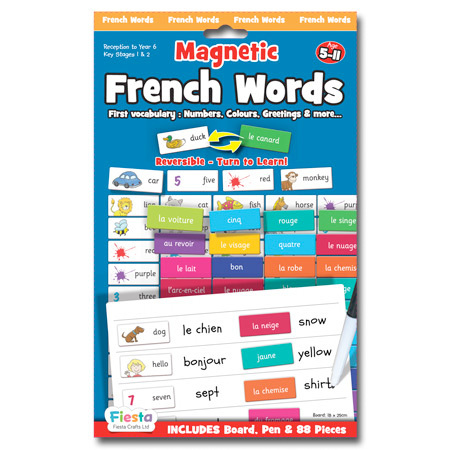 Magnetic French Words is a fun activity that will help children to learn their first words in French in a simple, clear and fun way. 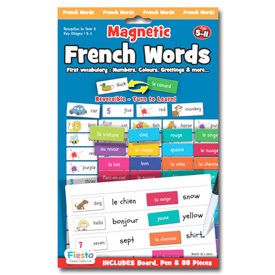 Using the double-sided French / English magnetic pieces, children will learn basic words, numbers, phrases, colours, animals and more, turning over each piece to reveal its translation. The pack includes 88 reversible pieces and a pen for use on the wipe clean surface. Pack contains: 1 magnetic board (18 x 25cm), dry-wipe pen and 88 double-sided magnetic tiles.